Do someone know the right HT votage please?. Schematic didnt say anything about HT. BUT a few months ago I made a simulation based on schematic and the waveforms chart available somewhere online. According to that 12ax7 should be running between 125-130V. I think that info will be usefull for people that's into repair, right? I will post later the links to the schematic when i can find them. I have a JMP1 rack, I will have a look at the voltages on the plates of the two valves. I will post back as soon as I get a chance to look at it. Hey Ice-9 I would appreciatte very much if you could do it. 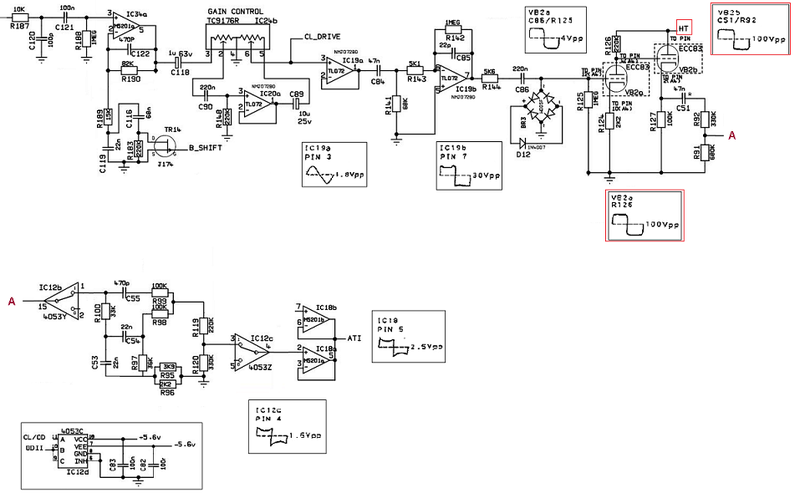 I made a sim on the JMP OD channel based on the schematic and the waveform chart thats around. Been reading that huge thread about JMP1 somewhere here and the simulation might answer some questions that the thread missed. I was planning to put all info in a thread, complete with a few audio samples. Problem is, my sim file imploded after an audio recording. I got kinda busy but I will try to re-do the sim, from scratch, all over again, make a couple of small audio samples and upload. Althou, I'm not sure where should I post everything as this would be related to an analisys from a simulation and not an actual amp/pre. I made a simplified extract of only the OD1 channel for a clear and quick reference of what i'm talking about here. I also included the waveform readings from the respective test points. All IC's are +- 15 VDC except IC12, as noted. So, according to this, HT should be 125 -130 VDC. I don't understand how people suggest changing plate and cathode resistor values without mention this anywhere. Its weird cause it is a 115/230 machine and our local net is 235VAC. What worries me is that heaters are at 11VDC, which is lower from what the schematic shows (12VDC unregulated, which by it self is on the low side).